If you’re looking for a job outside your current employer, it’s often helpful to avoid giving away your job search. That’s because if you’re discovered, it can sour your relationship with your boss, which can be detrimental if you change your mind about obtaining another job. And, there are some managers (hopefully rare) who may even take the drastic step of ending your employment. Hiding your job search can be difficult in this era of social media use, so always think before you act when it comes to posting anything online or discussing your activity with others (especially co-workers). Keep profiles updated. Always keep online profiles up-to-date so you won’t trigger suspicions when you’re actively looking. That way, people think you’re diligent in keeping your information accurate, as opposed to thinking you’re job hunting because you rarely make any updates and then suddenly make changes. Lie low electronically. Unless you currently don’t have a job or are working for yourself, avoid social media posts telling others that you’re looking for a new job. This sounds obvious, but you’d be surprised how many people actively discuss their job hunt in social media forums – and then can’t figure out how their employer found out. Be careful what you display online. If you join groups for job hunting online, make sure they’re hidden from view in your profile. For example, on LinkedIn you can change your Group settings so certain groups aren’t visible on your public profile. Don’t wallpaper the world with your resume. Contrary to what many people think, uploading your resume to every possible job board or job site usually won’t get you the job you desire. Even worse, it could get you unwanted publicity with the wrong people seeing it, such as you current company’s HR recruiters or your boss. Instead, take the time to conduct research and target your resume to only those few key jobs you really want. Conduct your job search from home, not work. Never use company equipment, such as a company computer or mobile phone, in in your job search because these leave electronic footprints that can be traced if the company chooses to do so. Further, co-workers can easily overhear your telephone conversations in a cubicle environment and sometimes even see your computer screen. Conduct job hunting on your own time. 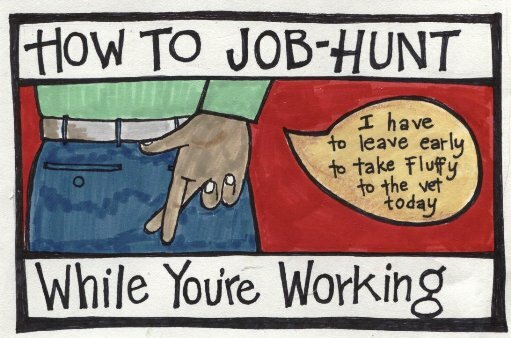 Never conduct your job search on company time, because that’s the same as stealing from the company (you’re stealing work time). Take a personal day or vacation day for job search work (or use your lunch time and home computer), telephone interviews, and in-person interviews. Choose appropriate times for telephone interviews. Preferably, schedule telephone interviews before work, during lunch, or after work. Even better, schedule them for your day off. Most hiring managers understand that if they’re interviewing someone already employed, then they’ll need to work around the person’s schedule. Further, most savvy hiring managers look for potential employees who specifically state that their telephone interview needs to be scheduled at a time that won’t conflict with their existing job, so they won’t break any company policies. Schedule in-person interviews during time off of work. Take advantage of your days off, paid time off, or vacation days when you need to attend in-person interviews. Avoid using sick days for interviewing – Murphy’s Law will usually will kick in and you’ll inevitably see someone from work who knows you’re supposed to be at home sick. Shhh. Not everyone at work is your friend and can keep information confidential – so be careful whom you tell. “Lindsey” (name changed) once confidentially shared with a co-worker that she was looking for another job. She thought this person was her friend. The next day Lindsey’s boss confronted her about her job search. It turns out the co-worker was the person who shared the confidential information with others within the company and had purposely spread rumors so she could get Lindsey in trouble with their manager. If, however, you’re looking for a new job within your current employer, it will be difficult to keep your job search quiet. That’s because most companies require that your manager be notified when you apply for a position in a different department. This is to ensure managers work together and that no workload or productivity issues are created when an employee moves into a different job. It also helps prevent problem employees from hopping from one department to another. Even if your job search is internal, it’s still best to go about your job search quietly, with professionalism, and by following the tips above. Your head shot should add value to your profile. Fix these common mistakes to get it on the right track. In today’s marketplace, it’s not enough to have a well-written resume and a list of great referrals; it’s essential for every job seeker to develop and actively monitor their online professional brand. While a photo on your resume is still considered taboo, recruiters have come to expect a picture to accompany your online professional profiles. In fact, your LinkedIn profile is 40 percent more likely to get clicked on if it contains an image. However, not just any image will do. Choose your picture strategically so that it enhances, rather than damages, your professional brand. Ideally your photo should be 200 x 200 pixels or larger. Anything smaller and you’re guaranteed to end up with a fuzzy or teeny tiny image that just screams unprofessional. I recommend choosing a square head shot, as it’s sure to work with all your professional social media accounts. Stick with a standard head shot for your profile pic. Prospective employers and those in your professional network have no desire to examine your dental work, and a shot from far away won’t help them identify you at an event or interview. Remember, this picture is supposed to represent your professional brand – no one else’s. 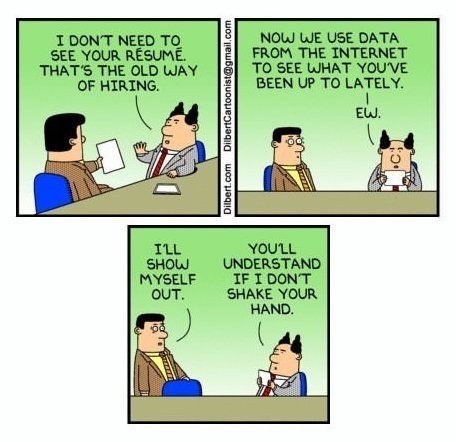 Don’t make recruiters guess which person you are in the photo. Use an image that shows you and only you. Cropping yourself out of the group shot doesn’t work either. While it may be your favorite picture, no one wants to see half of your loved one’s face or your best friend’s hair on your shoulder. Stick to a solo shot that doesn’t require Photoshop. Not only do these pictures look creepy, but they are certainly not providing employers with a positive, professional first impression. Opt for photos where you’re looking at the camera and smiling. You don’t necessarily need a cheesy grin on your face, but you want to appear friendly and approachable. The “glamor shots” aren’t doing you any favors. Remember, this image is supposed to represent your professional brand. 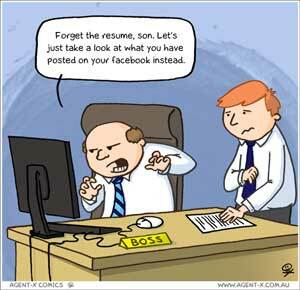 When you look at your profile photo, does it send the same message as your resume? Yes, your puppy is adorable and your family is beautiful. 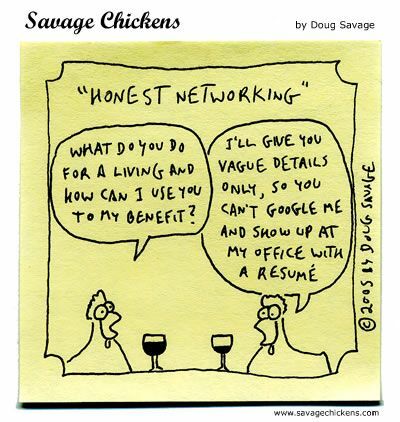 However, that’s not what your professional network or a prospective employer needs to know about you. Save these cute pics for your personal social-media channels such as Facebook or Instagram. 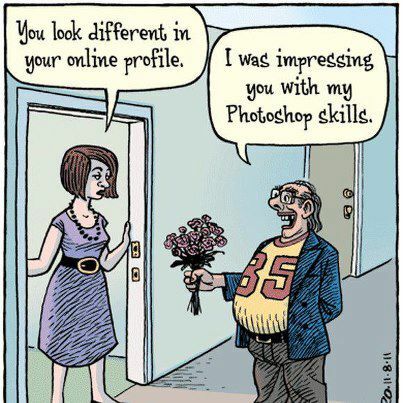 Stick to a photo of yourself for your professional profiles. If you’re concerned that including your photo could cause people to discriminate against you, I urge you to carefully weigh the benefits and drawbacks of the profile photo before making a final decision. The right image can reinforce your brand and help viewers connect more easily with your profile. Use a recent head shot that meets the file type and size and pixel size recommended by each site. Consider your outfit, the background of the shot, and the lighting to ensure it reflects your current professional brand and career goals. Having no photo is better than uploading one that doesn’t project the right image, so put some thought into the picture you choose to represent your professional brand. The world of personal branding has certainly changed over the past decade or so, especially with the impact of social media. It’s no longer enough to make an impression in person or on the phone; now you have to be sure your Facebook, Twitter, LinkedIn, and numerous other online presences are all coordinated and professional, to avoid presenting the wrong image to potential employers and clients who might be snooping around. In this somewhat more complicated branding landscape, there are countless possible brand blunders one can make that detract from brand value rather than building it. Below are ten of the most egregious errors so you can steer clear of them, keeping the brand called you on a smooth path to success. 2. Be wishy-washy. Strong brands express an opinion and take a stand. If you are trying to please all the people, you usually please none. Want to inspire people and connect with them on a deep level? Get clear about your point of view and make it public. Be willing to repel some people – all strong brands do. Know your message and be willing to stick your neck out and express yourself. 3. Act first. Think later. When it comes to personal branding, I see people building Blogs, using social media, and joining associations without any strategic plan for how it will help them build their brand and achieve their goals. Successful branding requires having a plan. Don’t act until you think – and make your decisions based on your brand strategy. Start by identifying your goals. Then get to know yourself, understand your differentiation, and discern what makes you compelling. You have to establish your brand promise before you can start to build the brand itself with your target audience. 4. Shoot for quantity. It’s not about the quantity of random LinkedIn connections or the number of articles you write or the number of tweets you post. Don’t seek quantity at the expense of quality. Quality is what will make your communications stand out and attract those whom you need to influence. Quality will get you noticed and help you build the right following. There’s tremendous pressure to be constantly visible in lots of social media, so our instinct is to just post, post, post without regard to the message we are sending or the suitability of our audience. Avoid this trap by focusing on quality. 5. Seek fame and glory. Branding is not about you, it’s about serving others. Fame is difficult to achieve, and if you make it your goal, you’ll focus too much on the attention you crave instead of focusing on the value you can deliver. You only need to be known to the people who are making decisions about you and those who influence them. I call it selective fame. Work to be known by decision-makers and influencers who will help you reach your goals. 6. Be binary. 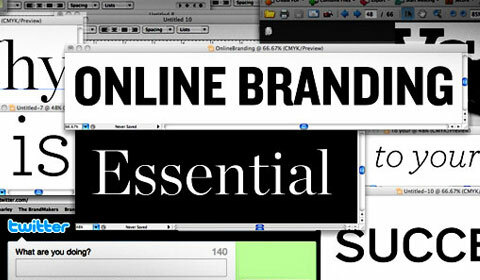 Branding requires a steady and steadfast approach. Being binary means that you divide your attention and run a two-track career, perhaps even thinking of branding as an activity that is separate from your career. Personal branding is not something you do occasionally with bursts of activity – like at the beginning of the year when you begin to work on your resolutions. Have a single, focused plan and act on it daily. Don’t let yourself run out of steam; slow, consistent actions will sustain you for the long haul. 7. Be exclusively virtual. Personal branding actually went mainstream when social media came onto the scene. This left many people thinking that personal branding is an online activity. It’s not – at least not exclusively. Sure, having a digital strategy for your brand is critical, but your actions every day and the things you can do in the real world matter. Shaking hands and scheduling face time (and I’m not talking about an online video meeting) bring your brand to life. You must put your personal stamp on everything you do. Think of your brand holistically, and you’re on your way to achieving your goals. 8. Go solo. Personal branding sounds like it should be an individual activity, and it is “personal,” but it’s not solo. The Lone Ranger syndrome will work against you. Even the Lone Ranger had Tonto. Much of the personal branding process has to do with being part of a community and contributing to that community. This is the key to building your personal brand network. Have a mentor, hire a coach, and reach out to colleagues and friends for their opinions. Don’t go it alone. 9. Be selfish. 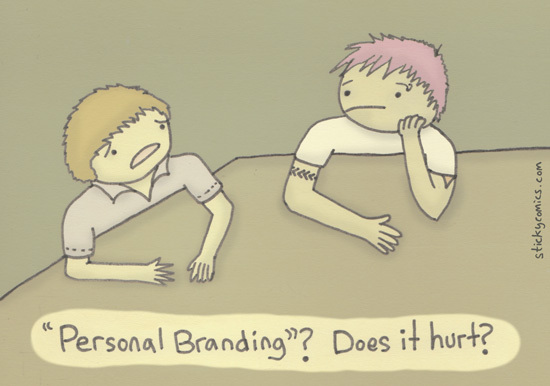 Personal branding is not about you. It’s about what you’re able to give to others. Generosity is one of the best strategies for personal branding. When you give to your network, you remind them you are there through actions that also demonstrate how grateful you are for your success. When you give to your team, you show them you care. When you give away your services, you let people discover firsthand what you’re great at. 10. Forget to measure. You could be spinning your wheels, but you won’t know unless you measure. That means setting up-front goals for your personal branding activities. Your goals might be the number of thought-leaders in your area of expertise who know you, or the influence you create internally, or being recognized by a relevant professional association. Whatever your goals, document them. Focus on them. And measure your momentum as you strive towards them. Regularly – say quarterly or monthly – evaluate your progress against your goals – and refine your strategy accordingly. If you avoid these personal branding don’ts, you can make a name for yourself that fuels your success for years to come. Why Won’t They Hire Me? You’ve applied for every job out there, and no one is getting back to you. Why? Who cursed you with this jobless existence? The number one biggest mistake people make (and one of the easiest to avoid) when applying for jobs is having typos on their resumé. No matter what the job is, no one wants to hire someone who doesn’t even use spell check. Or even worse, if you’ve made a grammatical error that leads to a humorous misunderstanding (example: occupation – internet booger instead of blogger); that’s just awful. It’s not the end of the world, of course, if you spell your own name wrong on your C.V. It is if you then send it out to everyone, however. Just spend two or three minutes proofreading what you’ve written. If you’re unsure, get a friend to look at it for you or leave it to the professionals. 2: Not having an online presence or having a bad one. If you’re applying for high-end jobs, potential employers are going to want to know as much about you as possible. If they make a quick search on Google and they can’t find you, it won’t look good. They want to see for themselves the work you have done in the past and what you’re capable of. Some ideas for getting your online presence rolling: set up a LinkedIn account and create profiles on freelance and industry websites. On the other hand, if your potential employer looks you up and finds a picture of you hitting a bong, it’s going to be even worse than having no presence at all. By all means, post your social life online, but make sure it’s private. It should be just for your close friends. Facebook allows you to view your profile as a member of the public would see it. You should definitely try this out, so you can see what potential employers see and make sure you’re not revealing more about yourself to them than you might want. 3: Using an informal email address. No matter the situation, you should always have a professional email address for use on your resumé. If you were hiring, would you pick “John.Doe” or “iLikeCars93” or “fluffybunnies”? Choose something with your name in it and if you need to include numbers, select the year of your birth or graduation from college (i.e., george.hamilton1990@gmail.com). When you’re reading so many job descriptions because you’re busy applying for everything on the internet, you probably don’t read each of them thoroughly; you’re likely just skimming before applying. However, you should always read each description all the way to the end. Often there will be instructions included, sometimes just to check to be sure you’ve actually read it! Employers won’t want to hire someone for a job who can’t even follow the simple instructions to apply for it. 5: Focusing solely on jobs posted online. It’s incredibly convenient having all those jobs available there on one page (whether Monster or CareerBuilder or one of the aggregate search engines like Indeed), saving you the effort of wandering from place to place just to be rejected. However, it isn’t perfect. There are plenty of places hiring that don’t put their jobs up on the internet: some prefer face-to-face interviews straight away; some just don’t want the hassle of receiving and sorting through thousands of random responses like yours. You might be missing some great opportunities if you stick only to the online job boards. Branch out: seek referrals from people already working at a company or reach out to hiring managers directly at places that don’t seem to be hiring… you may be surprised by the roles on offer. 6: Failing to ask questions in an interview. We’ve all been there: they ask if you have any questions at the end of the interview and you have no idea what to say. Or you just don’t want to make a fool of yourself by asking a stupid question. So you wing it: “no, I don’t have any questions”. The problem here is that you seem uninterested and uninformed. You want your future employer to be interested in you, and yet you don’t seem to be interested enough in the job or the company to ask questions about them! Have a few good questions prepared in advance about the role, the company, etc. so they know you’ve been doing your homework. On “Project Runway,” Heidi Klum often declares, “One day you’re in, the next day you’re out.” While she’s referring to fashion, the cyclical nature of trends extends to résumés and job-search tactics as well. 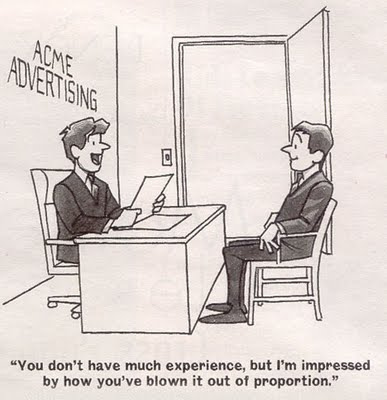 And if your résumé style is out in 2014, you may well be out, too. To make sure you’re keeping up with the trends and away from major résumé disasters, check out what’s in and what’s out in 2014. Many employers use applicant tracking systems to screen résumés and generate a short list of candidates. To ensure that your résumé makes it through the ATS, try greater research into the position and employer to identify a higher percentage of the employer’s keywords associated with specific positions, then creatively embed them in the application and résumé. 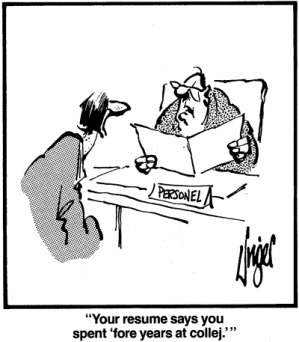 Just as no two jobs are the same, no two résumés should be the same. Boyer suggests creating multiple drafts and formats for different roles, to make it through different application mediums and screening tools. Create multiple résumés, customized for each position, in both .txt and .doc formats to allow for use in online applications and ATS‘s (.txt), and for traditional printed copies and PDF emailing (.doc). Replace the outdated ‘objective statement’ and include a summary of your qualifications at the top of your résumé. This swap offers a more personal look at you and what you could bring to the job. This should be three to five sentences long and should be tailored specifically for the job you are applying for. Be straight to the point, and market yourself as the ideal person for the job. Be compelling and concise, using this section to paint a picture of your characteristics, experience and achievements. While you only get so much room on an application or résumé, there’s likely much more you’d like to share with prospective employers. The best way to do this? Include your LinkedIn URL. First, if you haven’t already, you should create a LinkedIn profile, as LinkedIn profile URLs are becoming standard to put on your résumé. A LinkedIn profile will allow prospective employers the opportunity to learn more about your skills and better assess your qualifications. Make sure to fully develop your profile prior to listing your URL and align your résumé’s goal with your profile, so both are telling the same story. Similar to the objective statement, including references or “references available upon request” is a waste of valuable résumé real estate and just repeats the obvious. ‘References available upon request’ was great in 1955. Not so much now. What are you going to say — ‘References not available upon request’? Instead, expand other sections that need the space. Create an “Additional relevant information” section, where you can list your skills, languages, training, certifications, and technologies that are immediately relevant to the desired targets. The average person is spending more time on the internet than they ever before. Life revolves around social media accounts like Twitter, Naymz, Linkedin, and Facebook. In reality, having a profile on any of these social media sites is like virtually exposing yourself to the world and they can be just as important to your online image as your attire and manner are to your offline image. Therefore, you need to keep these accounts well-managed, updated at all times, and free from images or information that might put you in a bad light. Social media is a great way to make initial contact with potential business associates and to effectively manage a much larger network than would be possible offline. It is also likely that, unbeknownst to you, your social media profiles are being checked by prospective and current employers, head hunters, and so forth. Thus, social media is a double-edged sword: it can work for your benefit but if not managed properly can lead to missed job opportunities or even termination. Avoid uploading inappropriate photos. A holiday snapshot with your family is fine but one where you are improperly dressed or engaged in inappropriate activity (drinking, partying, etc.) might damage your professional image. With the internet, these sorts of things can potentially go viral in a hurry and you should never assume anything is private after you’ve posted it somewhere on the net. Be careful about giving your opinions and views on certain subjects in public places. You’ve probably seen a number of celebrities and public figures lately who have regretted posting something on Twitter that ended up costing them a great deal, even their jobs. If you maintain a personal blog, understand that it may be visited by anyone in the world (including your boss). It is best to keep the content unbiased and steer away from any racist, political, or religious issues or negative comments about the company you work for (or your boss, for that matter). You could also utilize your blog to discuss relevant industry topics and as a place to show off your technical knowledge. A consistent online presence is important and even some modest efforts will help ensure that your online brand matches not only your offline image but also the professional persona you want to portray to the world. With recruiters and potential employers lurking about the web, it pays to be prudent and proactive.